Pawnee Nation of Oklahoma is a federally recognized tribe of Oklahoma. Per the Bureau of Indian Affairs, Field Solicitor, the Pawnee Nation is the only federally recognized reservation in Oklahoma, owning both the top and bottom soil of their tribal lands. Their tribal headquarters is located in Pawnee, Oklahoma with tribal jurisdiction extending to parts of Noble, Payne, and Pawnee counties. 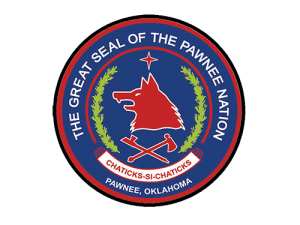 Their tribal constitution establishes the government of the Pawnee Nation of Oklahoma. This government consists of the Nasharo Council, the Pawnee Business Council, and the Supreme Court. The Pawnees were classified as a “friendly tribe” by the U.S. Government. They were men and women of great courage and endurance. Some of the Pawnee warrior battles fought to preserve lives, lands and possessions were considered legendary. One such battle was that led by Crooked Hand of the Skidi Band, who arose from bed to muster the old men, women and boys and lead the charge to defend their home. Though outnumbered two to one, they defeated a superior enemy and drove them away. After encroachment by white settlers, the Pawnees ceded their territory to the U.S. Government and in 1875 were removed from Nebraska to what is now Pawnee county, Oklahoma. The Pawnee Indian Agency and the Pawnee Industrial School, an Indian boarding school, were established just east of present day City of Pawnee. By 1958, this school, also known as “Gravy U”, was closed and in 1968 the land was returned to the Pawnee Nation. Many of the former Industrial School buildings now serve as Tribal offices and as a home for the Pawnee Nation College. The area is on the National Register as a Historic District. The Pawnees have served in all military conflicts to date beginning with the Pawnee Scouts that served during the Indian Wars. A ceremony was held on Oct. 15, 2011 to honor the decision of the Bravo/Pawnee Company 486th Civil Affairs BN of the U.S. Army to alter their name to reflect this distinguished Pawnee tradition. Per the Bureau of Indian Affairs Field Solicitor, the Pawnee Nation is the only federally recognized reservation in Oklahoma, as they own both the top and bottom soil of their tribal lands. Today, the number of Tribal enrolled members is over 3,200 and can be found in all areas of the United States as well as foreign countries within many walks of life. Pawnees take much pride in their ancestral heritage. They are noted in history for their tribal religion rich in myth, symbolism and elaborate rites. Today the Pawnee Nation supports many activities including honor dances, Native American Church meetings, hand games and sporting events. The Pawnee Indian Veterans also host a Memorial Day Dance, a Veterans Day Dance and a Christmas Day Dance. The Pawnee Indian Veterans Homecoming and Powwow occurs the weekend that falls closest to the 4th of July. Per the Bureau of Indian Affairs, Field Solicitor, the Pawnee Nation is the only federally recognized reservation in Oklahoma, owning both the top and bottom soil of their tribal lands. Their tribal headquarters is located in Pawnee, Oklahoma with tribal jurisdiction extending to parts of Noble, Payne, and Pawnee counties.881 Little Dee Dr. The Pawnee language is a Caddoan language spoken by some Pawnee Native Americans who now live in north-central Oklahoma. Per the Bureau of Indian Affairs Field Solicitor, the Pawnee Nation is the only federally recognized reservation in Oklahoma, as they own both the top and bottom soil of their tribal lands. The number of Tribal enrolled members is now over 3,200 and can be found in all areas of the United States as well as foreign countries within many walks of life. Pawnees take much pride in their ancestral heritage. They are noted in history for their tribal religion rich in myth, symbolism and elaborate rites. Today the Pawnee Nation supports many activities including honor dances, Native American Church meetings, hand games and sporting events. The Pawnee Indian Veterans also host a Memorial Day Dance, a Veterans Day Dance and a Christmas Day Dance. The Pawnee Indian Veterans Homecoming and Powwow occurs the weekend that falls closest to the 4th of July. The Pawnee operate two gaming casinos, three smoke shops, two fuel stations, and one truck stop. Their estimated economic impact for 2010 was $10.5 million. Increased revenues from the casinos have helped them provide for education and welfare of their citizens. They issue their own tribal vehicle tags and operate their housing authority.